Today I have another round of goodies from my surprise Llarowe box (it's the gift that keeps on giving!!). The CrowsToes Fall 2013 Better Late Than Never Collection couldn't be more appropriate considering I'm posting it just as the Spring 2014 shades are arriving. The good news? It's not too late! Every single one of these polishes is still available on the Llarowe website. Woot! This is my first experience with CrowsToes and I couldn't wait to dig in. Black Widow is a black holo with a sprinkling of red glitters. So pretty. Often black holos translate into charcoal gray on the nail, but this one stays dark and sparkly. I wish the red glitters were more obvious in my pic, because they give it a nice touch. This is two coats. Indian Summer is a beautiful burgundy purple that shifts to pink and orange. It has a smooth jelly-ish finish and a touch of shimmer. My swatch is three thin coats. The Dragon in Drag macro shot on the CrowsToes blog had me swooning (see it here). I love purple and green together. It also includes blue and gold glitters...all in a clear base. The glitter payoff is really nice. This is one coat over butter LONDON Slapper. I finished this swatch with two coats of topcoat. Half Past Yesterday has a purple base filled with multi-sized copper and gold glitters, accented with a touch of copper shimmer. I love the copper in this! The purple is fairly sheer, so you may want to layer it. I used three generous coats for my swatch and I could still see some sheer spots in some light. Hellbound is a deep burgundy with a golden shift and shimmer. My photo doesn't show the shift well, but it does show you how that shimmer really gives it depth. I used two coats. Quarter Till Today is a coppery shimmered version of Half Past Yesterday. I read The PolishAholic's review and she compared this to THE Clarins 230 (minus the shift in the shimmer) and I was soooo excited to try it. I have Clarins 230, you know. My hubs and daughter got it for me for Christmas 2012. New in Box even! But I'm scared to use it. Gah! So Quarter Till Today is the closest I've come. I wish I'd taken Jen's advice and layered it. It would have given the shimmer a little more punch. This is two coats. 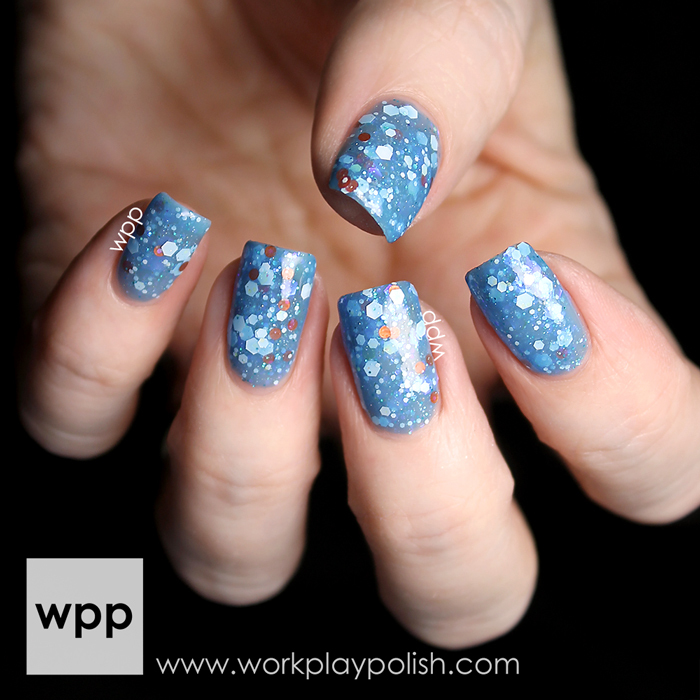 Zero has a sky blue crelly base and is packed with white/iridescent glitters in various sizes and accented with round orange glitters. The formula is a little thick with all that glitter, but it's manageable. I did one thin coat just to get a good smile line, and then one generous, dabbing coat for coverage. This color combo is great for spring and summer too. This swatch was finished with two top coats. 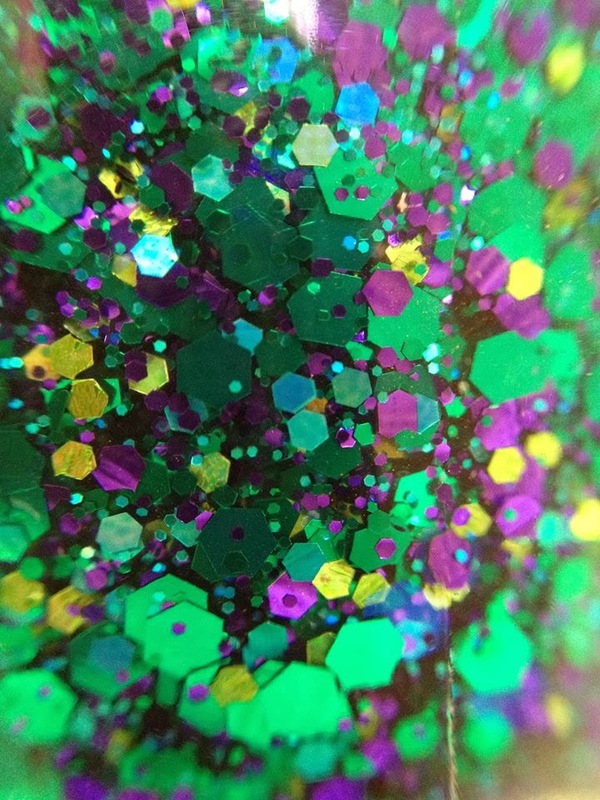 And finally, You are Here is a dark black-based polish loaded with a dense mixture of multi-colored glass flecks in every color. You can see the shimmer in all types of lighting, which was surprising considering the density of the black base. All of these polishes had a good formula, but this one...wow...it's one of those polishes that you really ENJOY polishing. (I know, that sounds a little creepy. But admit it, you know what I mean!) My swatch is two easy coats. Each swatch is finished with G&G HK Girl topcoat. Overall, I'm really pleased with my first CrowsToes experience. The formula was great and the variety was even better. Black Widow just might be my fave. What's yours? The CrowToes Better Late Than Never Fall 2013 Collection is available at www.llarowe.com. Each 15mL bottle retails for $13USD. Follow Llarowe on facebook for news and promotions...and follow the CrowsToes blog too!